During 7-9 March 2017, immediately following their US debut at the Ellen Stewart Theatre at La MaMa in New York City, Grusomhetens Teater spent some evenings rehearsing with the Living Theatre. This is the 2nd phase of a international, multi-part, artistic collaboration between the two groups, which began in December 2016, when members of the Living Theatre came to Oslo and worked at GT´s space at Hausmania, as well as offered workshops to the public. The shared project is Venus & Mars, a staging of the final yet incomplete manuscript that LT co-founder Judith Malina was working on at the time of her death, in 2015. In addition to Oslo and New York, the groups plan on meeting in Avignon this summer to continue the collaboration, with an intended premiere in Norway later this year. While separated by the Atlantic Ocean, Grusomhetens Teater and the Living Theatre have forged a strong bond over the years, through hosting numerous workshops for each other in both New York and Oslo, including one of the final workshops by Ms. Malina (in 2013). The two companies are also influenced by the writings of Antonin Artaud, whose vision of a theater that is both physical and revolutionary they have interpreted in distinct yet overlapping ways throughout the years. 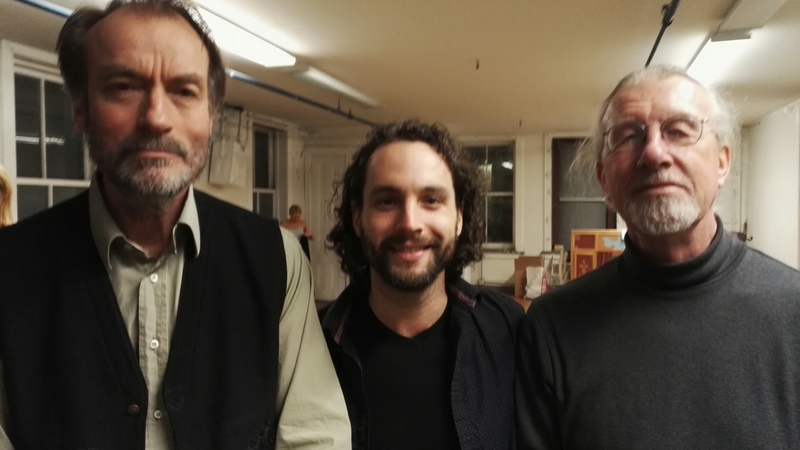 Picture (from left to right): Lars Øyno, Artistic Director, Grusomhetens Teater (Oslo); Brad Burgess and Tom Walker, Co-Artistic Directors, the Living Theatre (New York). Photo by Brendan McCall, 7 March 2017.